The Pop-Up Village teams up with Rafiki Coalition for their 11th Annual Black Health & Healing Summit! The Summit features dynamic speakers, health symposia, health screenings, local performers and artists, nutritional food, free therapeutic massage, chiropractic and acupuncture services, a vendor fair and the Pop-Up Resource Village. Keynote panelists are Dr. Wade Nobles, founder and executive director of the Institute for the Advanced Study of Black Family Life and Culture, Inc., and Dr. Joy DeGruy, internationally renowned researcher, educator, and author of Post Traumatic Slave Syndrome: Be the Healing. Please help our students attend prom this year! Any donation large or small will make our Masquerade Ball on June 1st A NIGHT TO REMEMBER. We invite you as our “virtual” sponsor dates! Remember...it's so nice to be asked! Please hear our students' appeals in the quick video below...Thank you, in advance, for making the Five Keys Prom 2018 a dream come true. Got prom dresses, accessories or men't suits you'd like to donate? Please contact Michelle for pickups. Rafiki Coalition and the Pop-Up Resource Village present an expanded First Saturday Health Party, with complementary medicine, cardio soul movement, cooking for life, lunch and table talk, bike-powered smoothies, barber & hair stylist, pop-up shops, arts & crafts, book mobile, tech mobile, kids’ zone, and more! Joined by our community partners: Five Keys Schools and Programs, Butterfly Movement, Literacy for Environmental Justice, 3rd Street Youth Center & Clinic, and Renaissance Entrepreneurship Center. Acupuncture, Chiropractic, Massage, Reflexology, and Health Screenings. Appointments available until filled (some services fill sooner than others). Active movement for men and women to gain body strength and move to soulful music! For more information or RSVP please visit our Facebook Event Here. 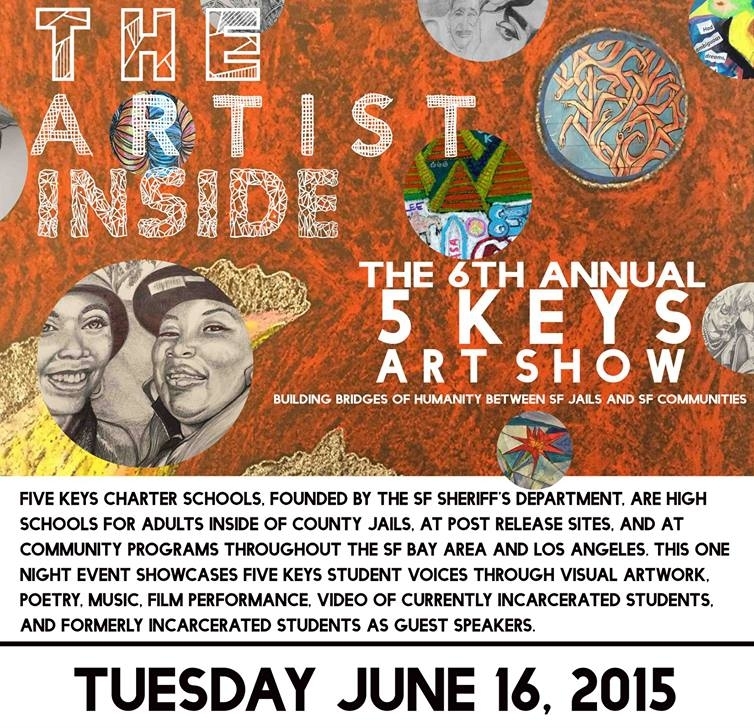 6:00-7:30 pm: Guest Speakers, Poetry, Video of incarcerated students, performance, and more!